Since 1981, the law firm of Philip E. Miller PC in Old Bridge, New Jersey, has served as a trusted legal resource for those seeking professional guidance on a wide range of matters. 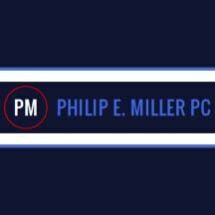 Philip Miller is known and respected as an attorney who dedicates himself to performing a job well done. Municipal law: He represents those facing DUI/DWI charges, disorderly persons charges and other charges at the New Jersey municipal court level. Real estate law: Residential real estate sales, purchases, refinancing and other transactions involve complex legal issues. Whether you are a buyer or seller, you can turn to Philip E. Miller for detailed guidance. Personal injury: Have you suffered injuries as the result of a car accident, slip-and-fall accident or other accident involving another's negligence? Attorney Philip E. Miller has obtained seven-figure settlements on behalf of personal injury victims. He can help you, too. Civil litigation: The firm offers experienced representation on other types of civil litigation matters. As your advocate, attorney Miller will personally handle every aspect of your case, providing one-on-one legal counsel and strategic advice. He will treat your legal matter with the extreme care and attention it deserves. To arrange a free consultation with Philip Miller, please call 732-707-1936. Evening and weekend appointments are available for your convenience.